Grete Jalk (1920-2006) is remembered most notably for her mastery of classic Danish forms. Her designs were expressed in clean, simple lines that offered useful comfort efficiently produced by modern manufacture. Initially a liberal arts student, she studied at the Design School for Women 1940-43, then the Danish Design School in 1946 (returning as faculty 1950-60), and with Kaare Klint at the Royal Academy Furniture School. 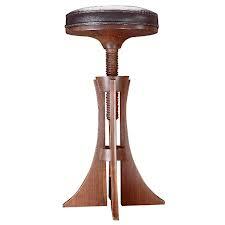 Her first great design was the Stool in 1961, whose simple, elegant lines launched her career, and is acknowledged today as a classic in the history of Danish furniture. Her talent was confirmed by winning both 1st Prizes in a 1963 Daily Mirror contest to design He & She chairs. Ironically, the radical form of her winning entrys made Jalk famous but proved too difficult to manufacture at the time, and was only commercially made in 2002. The Mobius-like, single flowing ribbon of molded plywood was inspired by the works of Alvar Aalto and the Eamses, and just as their earlieist designs using the same material, had serious production difficulties inherent in the design that were only overcome by technical advances in later decades. Jalk is admired on the craft level for her use of unusual and innovative joinery such as foxed or tenoned joints. Over her long career, her furniture designs were produced by a variety of makers including Fritz Hansen, France & Son, and especially P. Jeppesens. Many of Jalk's simplest designs were deliberately meant to be manufactured quickly and efficiently, and so were mass-produced. Her understanding and empathy for the manufacturing process was also valuable in her successful career as a designer of traveling exhibitions, most famously in a series of modular multi-purpose packing crates that could be used as display stands and shelving when empty. Jalk also designed textiles, wallpaper, and metalware. Finally, she was a respected editor, heading up Mobilier magazine for a dozen years in the 50s & 60s, and editing a 4-volume compilation of writings on Danish furniture design.